For making a princess cut kameez, use the same measurements as that of the normal kameez to make a paper draft till 9 to 10 measurement. After making the draft, make the following modifications on the draft. Join ‘d’ and ‘e’ through a curve and extend up to ‘f’. Then cut the paper draft into 2 by following the curve. Place neck part of the draft over the fold of the cloth and mark till the waist. Then take 1 to g = 6” or 8”. Leave ½” allowance and cut along the neck and sides and 1” along the bottom. Similarly cut the back piece. Then place the second half over the cloth and mark till the waist. Mark g to h=12” or 16” and ‘h’ to ‘I’=1”. Draw a curve, and leaving 1” along the sides and bottom and ½” along all the other sides, cut the cloth. In the same way cut other 3 pieces. Now there are 2 central pieces and 4 side pieces. Join all the pieces and continue to stitch the top by finishing the neck first then stitching the sleeves and finally joining the sides. It does not have an opening at the sides. Thanks Amina. 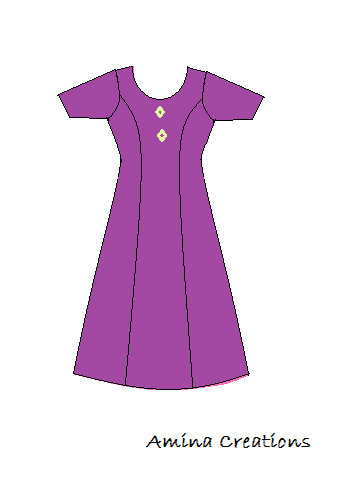 Thought the Princess Cut Kameez would be difficult to stitch. But after seeing your blog I am so happy that I can make one on my own. A video would be more helpful. Thanks for sharing. wow! this is so amazing! do you do videos too? please start doing youtube tutorials, i am sure you would get quite a following. Well explained about the stitching facts of sawar kameez.. we loved... Do sharing useful stuffs like this..
Amina ji,Very big hearted of you to share -explanation is so clear-normally beginners find it very difficult to stitch princess cut.Thank you very much.Please post video tutorials if possible. Mam, your princess cut draft pattern is too easy to understand.I have stiched one and it came good.For the last 10 yrs i never touched sewing machine and with the help of your pattern my first attempt itself become a great success.Thank you so much. Comments from my readers mean a lot to me and your words of appreciation encourages me to share more posts and tutorials.